an open [sketch]book: desperately seeking inspiration? Then the time is right to head over to the gallery at Mail Me Art. 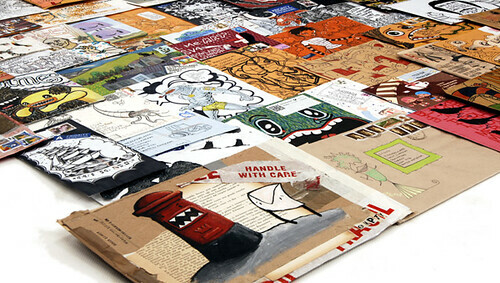 Following the success of last year's Mail Me Art, a second community art project invites creatives (both professional and amateur) around the globe to take ordinary envelopes and turn them into extraordinary works of art. The results will be exhibited, and cross your fingers, turned into a 2nd book. The submission deadline is tight [entries must be postmarked by January 31] but worth a try! Learn more about the ins and outs of this project here. This project sounds interesting...depends on if I can swing it. Thanks for your kind comments on my blog! Inspiration needed here too!! Perhaps I will look onto this project!! Looks interesting and not as harrowing as an entire sketchbook! So...maybe me and a couple of buddies. Thanks for the heads-up, Suzanne.